Protecting one’s family, personal property and personal space is	always a priority. Adding security to your home is accomplished by an	alarm or security system. Today’s alarms include sensors around	the house which warn you of potential intruders. Safety sensors detect	smoke, heat, and carbon dioxide and monitor your living space even when	you’re asleep or away. 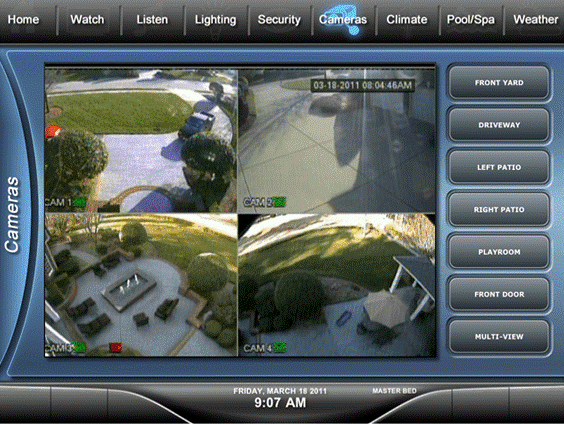 Integrating your home’s security system into your home automation	system will add even more security and convenience. Now, the many sensors	and detectors of the basic security system can be used to the fullest. Your home’s Security System can now control many different smart	functions around the house. Now, when you arm the alarm system for “Away	Mode”, it can actually lock all the doors. Opening a door or window	can create a voice announcement over the house audio speakers, for example,	“rear patio door has been opened”. Now, the in-wall keypad	isn’t your only option. Once installed, you can now arm and disarm	your security system with your remote control, smart phone or tablet. Imagine if one of your worst nightmares occurred in the middle of the night,	a house fire. Through your home automation system, your alarm can now	call the fire department, turn on all the lights in the bedrooms and halls	to light the way out, and unlock all the doors to ensure a safe exit. Now,	that’s added safety.